Hopefully everyone is enjoying their summer break! 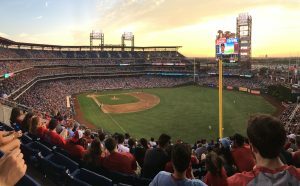 Nothing says summer quite like a baseball game, and right now SEPTA Pass Perks is offering buy-one-get-one-free tickets for select Phillies games. My fellow SEPTA travelers, this is an amazing deal! All that you need is either a monthly, weekly, or independence pass (or a SEPTA key!) and an even-number of friends. The remaining games that offer this deal are found here. You can choose to buy your tickets online from that page, or you can buy them at the box office. Make sure to bring your SEPTA pass if you buy tickets at the game! Really, you should have your pass with you because how else are you going to get to the game?? Nobody likes dealing with the mayhem that is the parking lot after a Phillies game. Why do that when the AT&T station of the Broad Street Line is right down the street? Esther, Jeff, Jon, and I did just that and headed out to a game on Friday night. What better way to spend a Friday night than spending time with friends, eating hot dogs, and jeering Mets players? We bought our tickets at the box office, which was super easy. Just show the teller your pass, and they will show you what sections are left for tonight. We went with the college-student-budget tickets, which were 10 dollars per person, might I add! We sat over third base in section 307. The sun set soon after the game started, but the stadium was as bright as day. Even from way up in the nosebleeds, the game was fun to watch! The Phillies may have lost, but the whole experience was a win in my book (I know so cheesy but I had to). 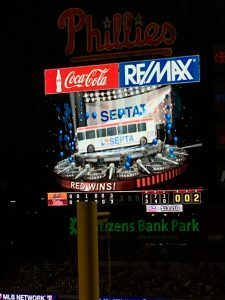 It is really easy to get to Citizens Bank Park by SEPTA. I took the H bus from Germantown to the Erie Station of the BSL, and from there took an express toward AT&T station. Esther came from Temple so she took the BSL from Susquehanna-Dauphin straight to AT&T station. Jeff and Jon came from 30th street station and took the MFL from 30th station to 15th station, where there is a free interchange to the BSL, and from there took an express toward AT&T station. You probably noticed a recurring theme—the Broad Street Line! We all had a lot of fun on this SEPTAdventure. 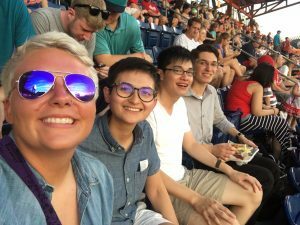 I really hope that all of you make it down to a Phillies game this season with a big group of friends, and don’t forget to keep it an even number! And if you do, don’t forget to tweet us a picture to @SEPTAYAC!